Love may be blind, but it can certainly see the joy of making that “someone special” feel extra special on Valentine’s Day. With that in mind, this issue can become your personal Cupid, providing lots of information and ideas to help you have a fabulous February 14! 1. According to the Greeting Card Association, an estimated one billion Valentine cards are sent each year, making Valentine’s Day the second largest card-sending holiday of the year. For what holiday are the most cards sent? 2. Who receives more Valentine’s cards – Teachers, children, or mothers? 3. 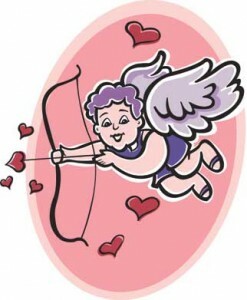 True or False: More than half of all Valentine’s Day cards are purchased in the six days prior to the holiday. 4. Which of these famous people was NOT born on Valentine’s Day – Jack Benny, Jimmy Hoffa or Tom Hanks? 5. The first commercial Valentine’s Day greeting cards produced in the United States were created in which decade – the 1840s, 1920s or 1950s? 1. An estimated 2.6 billion cards are sent for Christmas.